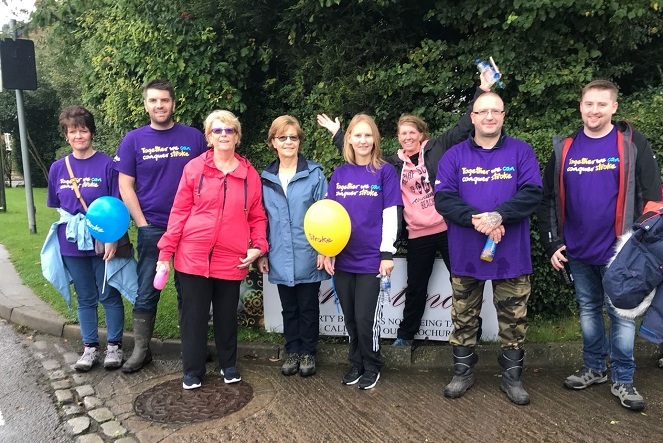 A group of staff from Earl Shilton Building Society have taken part in a sponsored walk in the Leicestershire countryside, raising over £480 for the Stroke Association. Mortgage Services Administrator Barbara Deveney organised the route for the walk, which took in five miles of public footpaths in the Market Bosworth area. She was joined by a group of around 20 intrepid walkers, made up of the Society’s staff and their families and friends. Mortgage Supervisor Jacquie Lennox also joined in the walk from her holiday in Portugal, planning out a route that she could follow concurrently with the main group. The Stroke Association is the Society’s nominated charity for the year, and staff also organised a successful afternoon tea earlier in the year in support of the charity, with fundraising topped up by dress down days. Barbara explained: “Walking is one of my favourite pastimes and I arranged a charity walk last year with my colleagues at the Society, which proved to be very popular. “We were all keen to arrange something similar again this year and use it as an opportunity to support the Stroke Association as our nominated charity. The Stroke Association is the UK’s leading charity dedicated to conquering stroke. They rely on public support and donations to provide vital services, campaign for better stroke care and to find better treatments. Abi Floyd, Community and Events Fundraising Manager from the Stroke Association, said: “With around 100,000 strokes a year in the UK – that’s around one every five minutes – it is vital that we have people who can raise funds for people affected by stroke. “We’re incredibly grateful to the team at Earl Shilton Building Society for taking on this challenge and choosing us as their charity of the year.